Worx has an interesting new cordless 20V circular saw called Exactrack. The model number is WX530 if you live in the UK and WX530L for those of us in the USA. 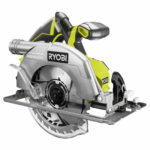 On the surface it seems like your ordinary DIY grade 6-1/2″ cordless circular saw but there’s one standout feature which is that the base is split into two sections with a large main portion acting as the base, and the smaller portion to the right of the blade is on a hinge to move up so you can rest the saw’s blade next to a straight edge guide when making cuts. With this feature you will no longer have to take into account the distance between the blade to the end of the base when clamping straight edges to your workpiece to make straight cuts. 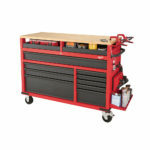 All you do now is mark your line, place the straight edge guide directly over the line, lift up the Exactrack portion of the base and rest the saw over the board being cut and nest it besides the guide. The raised portion of the base allows it to sit right over the guide and lines up the blade with the cut line and will cut flush with the guide. The above video shows the whole process in action and is a lot simpler than it sounds. 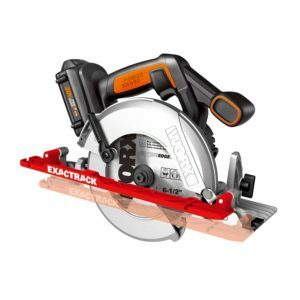 In my opinion it seems like a good idea as I’ve clamped cutting guides several times to make straight cuts with my circular saws and this Worx Exactrack saw would have made life much simpler then. I say then because I now use my table saw when I need exact precision for straight cuts. Many people don’t have table saws so a circular saw with this functionality would be a great tool for them if they clamp straight guides often to make straight cuts. I also want to mention that many circular saws come with rip fences which make life even easier than this Exactract saw or clamping guides but they can only make straight cuts if the edge of the board is straight and are only good for certain cutting widths from the edge. 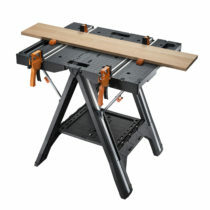 Larger widths will be beyond the capacity of an included rip fence so that’s where a clamped straight edge or even this saw will prove to be more useful. Pricing for this saw is $119 USD and that’s for the complete kit with an included battery (most likely 2.0 ah) and charger which makes it very affordable for a cordless circular saw. 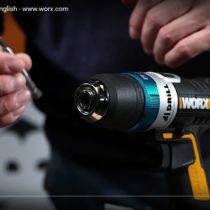 The included Worx 20V battery is compatible with the rest of Worx’s 20V tools meaning you can swap tools and batteries and they all work together. Big thanks to Cody Robertson for spotting this tool! Why do tool companies continue to release blade right circular saws when 90 percent of people on the planet are right handed. The link to Amazon does not work.